Sofia Priebe rowing in her Maas single at the 2017 Coastweeks Regatta on the Mystic River. Photo courtesy of Laura Manfre. Göran R Buckhorn caught up with Sofia Priebe, her mother, Laura Manfre, and Bob Berry, whom he met at the 2017 Coastweeks Regatta in September. Rowing coach and inventor Bob Berry. Photo: Göran R Buckhorn. Catching up with Bob, I asked him how he met Sofia. Laura Manfre, Sofia’s mother, confirmed this to HTBS in a telephone interview. So is Bob right about a ballet dancer making a great rower? Getting Sofia on the phone, I asked her if she agrees with her mother and Bob that ballet makes it easier to row? So you like rowing then, I asked? Is rowing a good sport for blind children and teenagers? Sofia and Bob. Under the little box at the aft of Sofia’s boat is Bob’s ‘Remote Coxswain’, with which he coxed her boat at the 2017 Coastweeks Regatta. Photo: Göran R Buckhorn. The boats they use at Ledyard Parks and Rec are six-oared fixed-seat 25-foot gigs and four-oared fixed-seat 16-foot dories, and ‘sliding seat training boats’. Those were the boats that Sofia and Dante started out in. But as a parent of a blind girl being out in a boat, were you never afraid she would fall overboard, I asked Laura? ‘No, not really,’ Laura answered. Not even flipping in a single scull, I tried? To understand how it was to row, Laura gave it a try, too, at Ledyard Parks and Rec. However, while it might have come naturally for Sofia to row, ‘rowing with a sliding seat didn’t come quite as natural to me, let’s put it that way,’ Laura said with a big laugh. 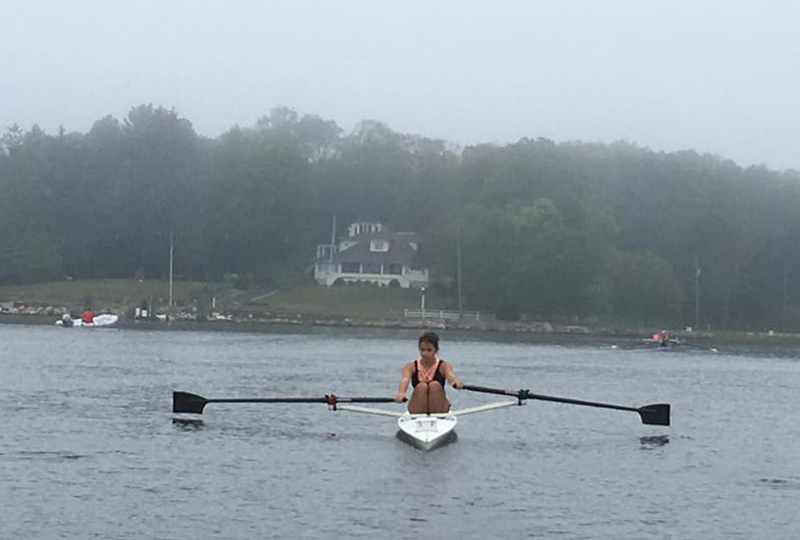 For the 2016 Coastweeks Regatta, Laura and a friend decided to enter in a double scull. Helping them down with the boat to the dock before their race, Bob shared some thoughts on capsizing: ‘Remember, Laura,’ he said, ‘there are two types of rowers, those who have flipped, and those who are about to…’ Laura and her friend managed to stay afloat throughout the race. Sofia. Photo: Göran R Buckhorn. I asked Bob what it is like to coach Sofia? Of course, I also had to ask Sofia: how is Bob as a coach? 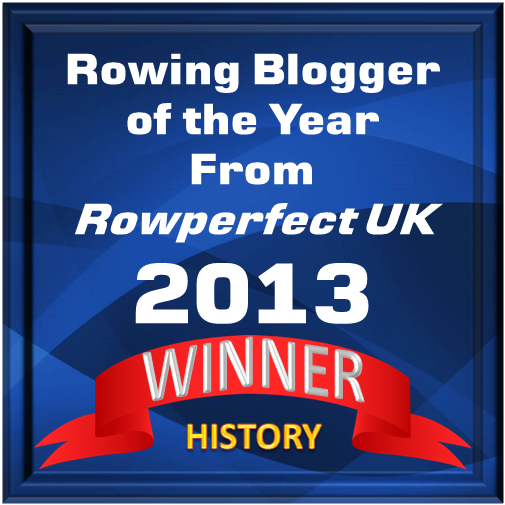 ‘He’s nice… and he’s very passionate about rowing,’ she answered. Bob started rowing late in life. Growing up in Gales Ferry, as a child he saw Harvard and Yale practice on the Thames and he watched the crews racing in ‘The Race’, the Harvard–Yale Boat Race every June. First in July 2007, at age 45, Bob began rowing. 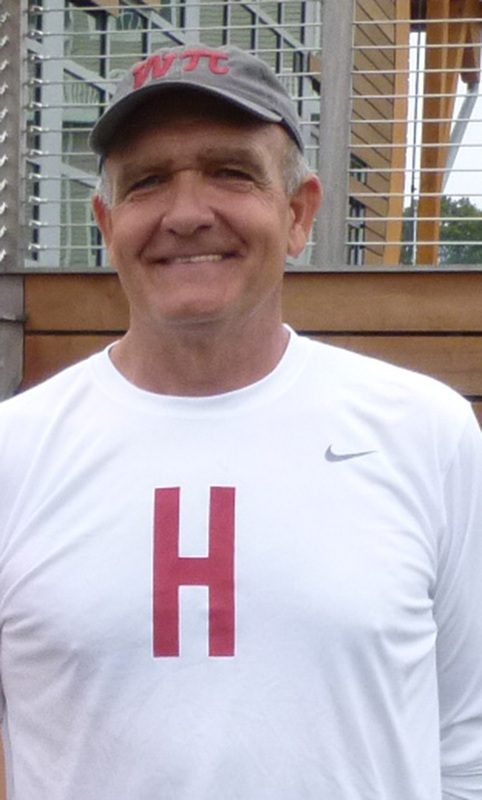 He soon started to coach rowing at Ledyard Parks and Rec. He is now hired by Harvard to do restoration work, plumbing, heavy tree work and excavation at Red Top, hence the big, red ‘H’ you can see in photographs of Bob. His sister, LeeAnn, is the caretaker of Red Top. Sofia and her family – her brother Dante, mother Laura and father Charles ‘Chuck’ Priebe – live in Ledyard. 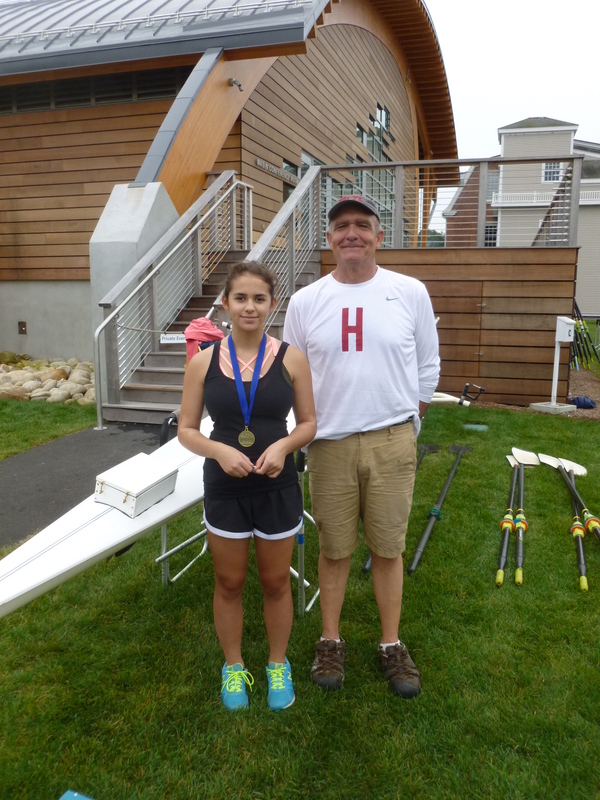 When Sofia started at Ledyard High School this autumn, the school didn’t have a rowing programme for the students. 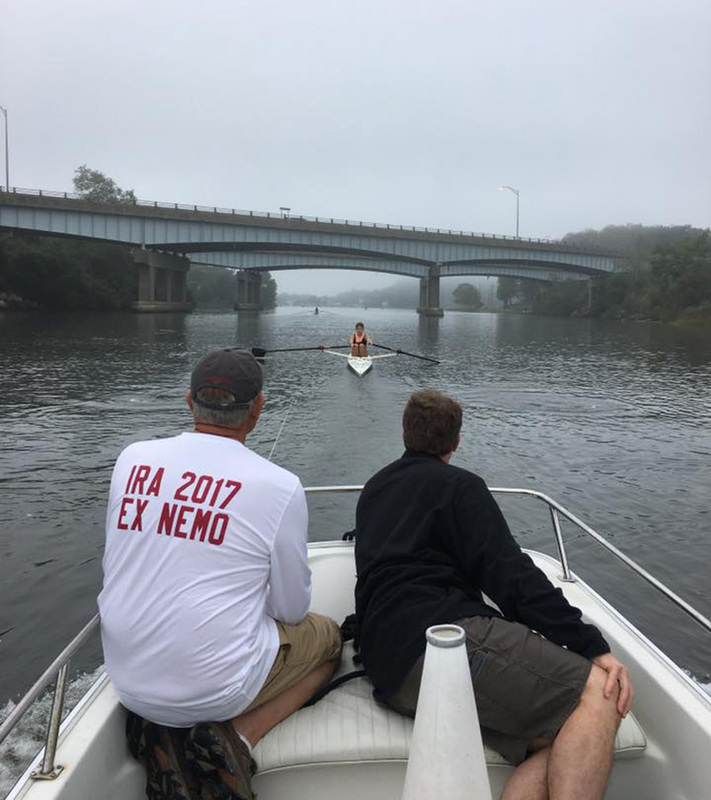 However, Noank Rowing Club, in cooperation with Groton Parks and Rec, invited those Ledyard students who were interested in rowing to come to their facility at Spicer Park to row on the Beebe Cove and the Mystic River. Sofia immediately signed up. Sofia playing around at Noank RC at Spicer Park. Photo courtesy of Laura Manfre. ‘Sofia cannot do team sports like the other kids in high school,’ Laura said. ‘Rowing makes her part of a sports team. 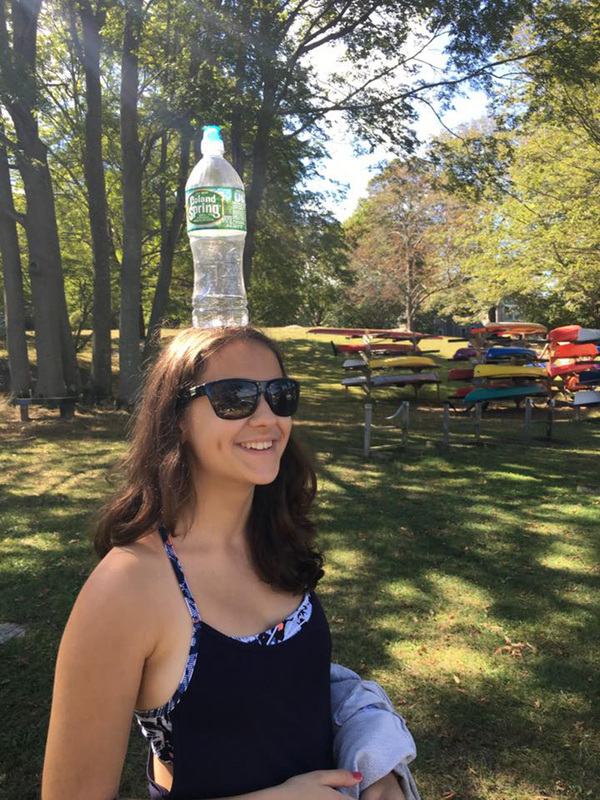 She was looking forward to being in a boat with other kids, her peers, in high school, and now she is.’ Laura said that Sofia took a break from dancing when she started to row at Noank RC a year ago, but now she has started dancing again this autumn. ‘Sofia told me that she can handle both dancing and rowing,’ Laura said. Sitting in a launch, which followed Sofia’s race on the Mystic River, Bob steered her boat with a remote control down the 2,000-metre course. Bob steering Sofia’s boat during the ‘straightest race’ at the 2017 Coastweeks Regatta. On Bob’s right is Sofia’s father, Charles. Photo courtesy of Laura Manfre. ‘Straightest line,’ Bob told NPR’s Karen Given, ‘straightest race, probably ever rowed on that course, ever.’ All radio listeners could hear how delighted and a little proud Bob sounded with his new innovation. And Bob’s remote-controlled rudder is a ground-breaking idea, which can also be fitted on kayaks and other watercraft. It can open a new world out on the water for children and adults who are blind. What advice would Bob give other coaches who might have children and teenagers with vision impairment on a rowing team? 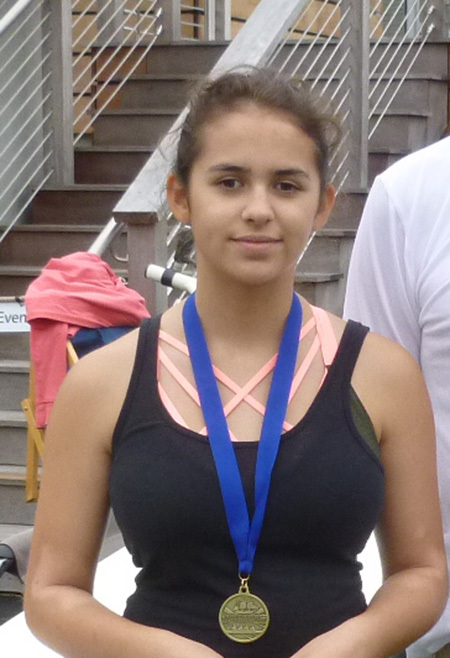 When I asked Sofia if she would like to continue to row in college, she hesitated slightly… ‘Maybe,’ she answered. When I put the same question to Laura, she said with certainty that Sofia would love to row in college. ‘Of course, she is only a freshman in high school now, so there are still some years to go before she is heading off to college. But if she would get the chance, I’m sure she would jump at the opportunity,’ Laura said. Sofia, Bob and his Remote Coxswain have started to make waves in the rowing community, also outside the USA. Not only was there the NPR interview, Rowperfect in the UK has published an article about them. A visually impaired teenager in England, Roesie Percy who rows with City of Bristol Rowing Club, has shown interest and contacted Sofia and Bob about the new innovation. Bob hopes to soon be able to help Roesie get a remote-controlled rudder on her boat. Right now, Bob is putting a remote-controlled rudder on a single scull, which the late Harvard coach Harry Parker gave him. Read more about Bob’s The Remote Coxswain here. Sofia with her brother Dante at the fundraising event Dinner in the Dark in October. Photo courtesy of Laura Manfre. In 2014, Sofia’s parents Laura and Charles started an organisation called Sofia Sees Hope, which aims to help children who have been impacted by Leber congenital amaurosis (LCA), which is a rare genetic eye disease that appears at birth or in an early stage of a child’s life and leads to a total loss of vision. The organisation also supports patients and families with other rare inherited retinal diseases. 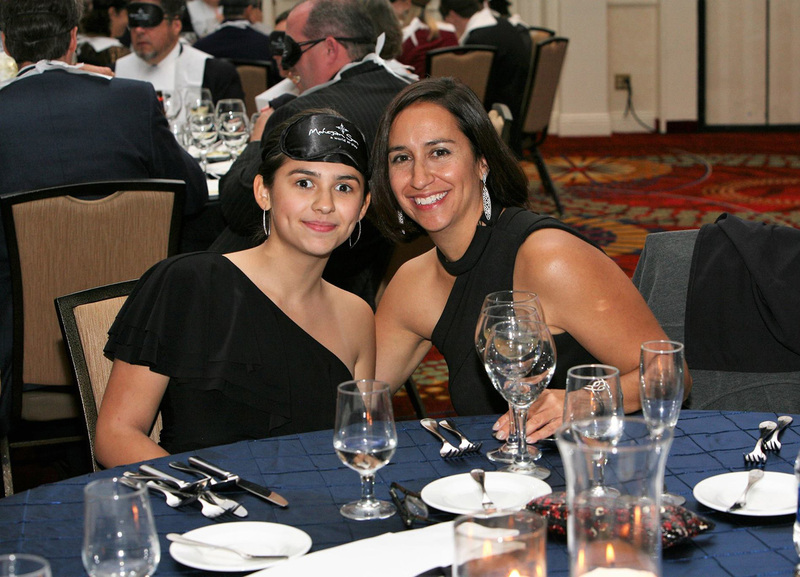 On 14 October, Sofia Sees Hope organised its fourth annual Dinner in the Dark, a successful fundraising event at the Mystic Marriott Hotel & Spa in Mystic, Connecticut, where more than 370 guests dined with eye masks to simulate blindness. Two days earlier, Laura had been in Washington, D.C., to testify to the Advisory Committee for the Food and Drug Administration (FDA) on behalf of the LCA patient community in support of the first gene therapy to cure genetic disease. The company Spark Therapeutics, which has done extensive research into genetic therapy for patients with RPE65 inherited retinal disease (IRD), presented their research to the committee. To the delight and happiness of the gathered families at the day’s hearing, the Advisory Committee unanimously recommended approval of Spark’s gene therapy to treat RPE65, one of more than 25 LCA gene mutations. Sofia with her mother Laura at the Dinner in the Dark in October. Photo courtesy of Laura Manfre. It’s with great interest HTBS will continue to follow the progress of Sofia’s rowing and Bob’s Remote Coxswain. Previous Is the Future of Nathan Benderson Park in Jeopardy? I know Bob and I am so impressed with his passion for rowing and his unwavering commitment to see this young girl do what she loves and it’s great exercise !! Good for you Bob !! I hope this goes nation wide !! I believe 1 person can open doors and pave the way for others and this holds true in this case !